Rex Hardy enters the MCLA Hall of Fame as an outstanding player. 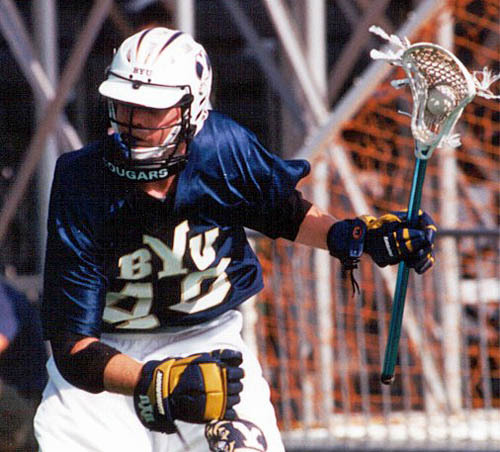 A rugged attackman with a knack for scoring big goals for Brigham Young, Hardy was often the focus of every defensive game plan for Cougar opponents. He was a three-time All-American, earning first team honors in 2000 and 2001. Hardy helped BYU qualify for nationals during all four of his years in Provo, including three trips to the national semifinals and national championships in 1997 and 2000. With Hardy as the leader of the offense, that Cougars team was the sixth highest scoring team in MCLA tournament history. “I am honored that former competitors, coaches and founders of the MCLA felt that I should join these great players in the inaugural MCLA Hall of Fame class,” Hardy said. “I am thrilled to enter alongside my coach, Jason Lamb. Hardy was a two-time captain for the Cougars and won numerous conference and team awards during his time with Brigham Young. During his senior season, he scored 44 goals and dished out 33 assists in 17 games.